WAILUKU — In a highly anticipated game, the Maui High School football team turned to defense and Naia Nakamoto for the winning formula in a 34-22 win over Kamehameha Maui on Saturday night. 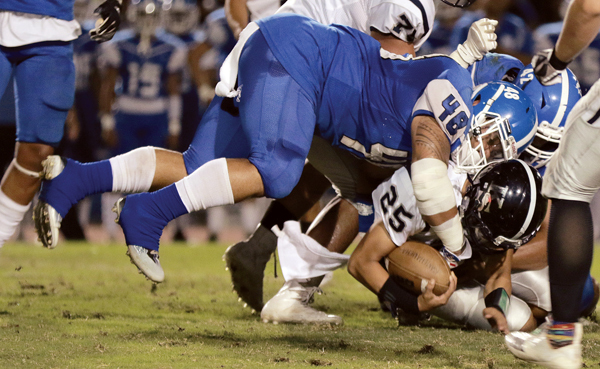 Nakamoto chipped away in a ferocious battle with the Kamehameha Maui defense all night until his lightning-strike 87-yard touchdown run up the middle finally put the game away late in the fourth quarter, sending a large Maui High homecoming crowd home happy. Nakamoto finished the game with 248 yards rushing on 25 carries — he now has 1,011 in five Maui Interscholastic League games, the first runner in MIL history to accomplish the feat so quickly. The last time the MIL had a 1,000-yard rusher in a single season, it had three. In 2006, King Kekaulike’s Shannon Kamakaokalani (1,079), Baldwin’s Chansi Bolosan (1,030) and Maui High’s Jonathan Los Banos (1,001) all broke the barrier the last time the MIL played 10 league games. Nakamoto’s burst up the middle gave the Sabers a 34-14 lead with 5 minutes, 44 seconds to play. The Sabers pushed their six-point halftime lead to 20-7 early in the second half when Mone Tongi scooped up a fumble forced by a Maui High sack of Tiliti Adams. Tongi scampered 71 yards to the end zone just 69 seconds into the second half. Karsyn Pupunu caught a 21-yard pass from Adams to bring the Warriors within 20-14 with 2:20 left in the third quarter. 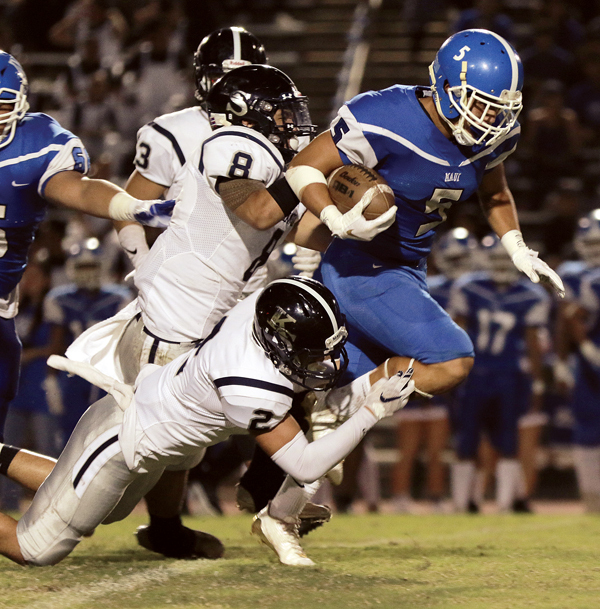 Maui High pushed the lead to 27-14 on Nakamoto’s 6-yard run early in the fourth quarter. 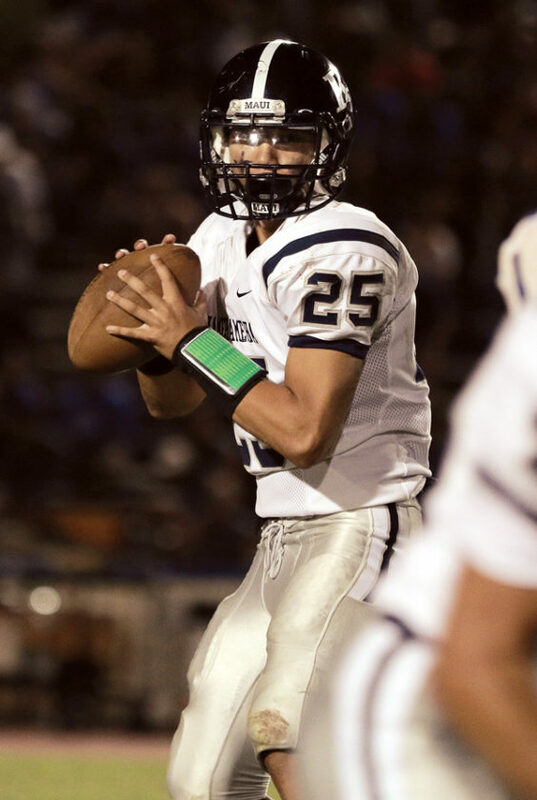 “I’m just very impressed with Kamehameha Maui,” Maui High coach James Kammerer said. “They really gritted it out and gave us a great contest. Hats off to them, but also our boys — we needed a test — and I was proud how we had some obstacles to overcome in the first half. The Sabers took a 13-7 lead into the locker rooms after a back-and-forth first half. 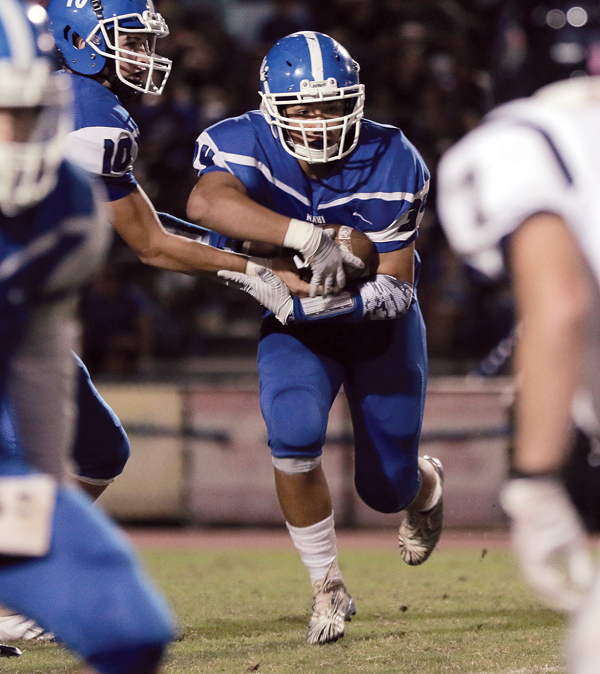 Nakamoto broke free for a 76-yard touchdown run less than 5 minutes into the game to give Maui High a 7-0 lead. 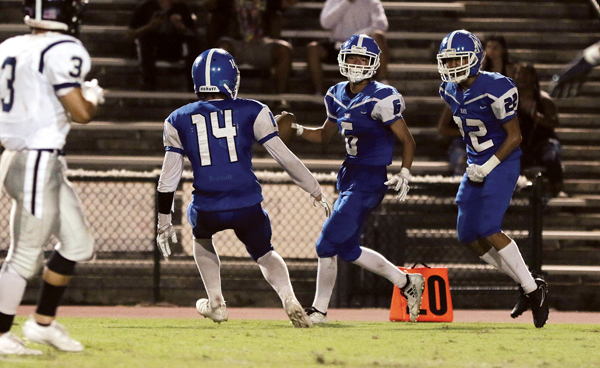 The Sabers stopped the Warriors on downs at the Maui High 29-yard line two plays before Nakamoto’s burst. Trent Takara intercepted an Adams pass to stop a threat and give the ball back to Maui High at the Warriors 19 early in the second quarter. Kamehameha Maui’s Kapena Gushiken returned the favor when he intercepted Brex Delray at the Warriors’ 5-yard line and returned it 41 yards to the Maui High 46. A 15-yard penalty on the Sabers at the end of the play moved the ball to the Maui High 39. Adams hit Dane Abarra for a 36-yard pass to the Maui High 5. The Sabers put Nakamoto in on defense but Adams hit Makani Smith-Kemfort on a 5-yard scoring pass to tie the game at 7-7 with 4:46 left in the second quarter. Just three plays later, Delray hit a wide-open Mitchell Hirose in stride for an 80-yard scoring strike to give the lead back to Maui High. Kamehameha Maui drove to the Maui High 22 late in the first half, but Sam Ostermiller’s 39-yard field goal was short as time expired. One play before that, the Warriors appeared to have a good chance to score on a fake field goal, but the Sabers were whistled for offsides, ending the play. MH–Naia Nakamoto 76 run (Brex Delray kick), 7:22. KSM–Makani Smith-Kemfort 5 pass from Tiliti Adams (Sam Ostermiller kick), 4:46. MH–Mitchell Hirose 80 pass from Delray (kick failed), 3:31. MH–Mone Tongi 71 fumble return (Delray kick), 10:51. KSM-Karsyn Pupunu 21 pass from Adams (Ostermiller kick), 2:20. MH–Nakamoto 6 run (Delray kick), 9:20. MH–Nakamoto 87 run (Delray kick), 5:44. KSM–Dane Abarra 6 pass from Adams (Pupunu pass from Adams), 3:20. Junior varsity–Maui High 23, Kamehameha Maui 0. LL–Sheldon Frias 3 run (Kaihulali Casco kick), 7:12. LL–Kamalei Watson 1 run (Casco kick), 3:18. LL–Jesse Dudoit 2 run (Casco kick), 11:22. LL–Kai Bookland 48 pass from Esekielu Storer (Casco kick), 9:21. LL–Devon Sa-Chisolm 25 pass from from Nainoa Irish (Casco kick), 8:52. LL–Tre Rickard 39 interception return (Casco kick), 7:41. LL–Kawehi Gillcoat 25 pass from Etuati Storer (Casco kick), 2:22. KK–FG Hanalei Akina 34, 0:00. RUSHING–Lahainaluna, Jonah Damasco 2-49, Jesse Dudoit 5-40, Irish 3-30, Frias 8-20, Etuati Storer 2-20, Watson 2-3, Nainoa Kulukulualani-Sales 1-2, Casco 1-2, Imee Koike 4-2, Zeff Dudoit 1-(minus 4), team 1-(minus 4), Rickard 2-(minus 12); King Kekaulike, Trey Hunter 14-41, Lanakila Day 8-7, Logan Kaina 3-6. PASSING–Lahainaluna, Irish 6-7-0–140, Esekielu Storer 3-4-0–88, Etuati Storer 1-1-0–25; King Kekaulike, T.J. Perkett 3-8-3–31. RECEIVING–Lahainaluna, Bookland 3-110, Damasco 2-23, Kulukulualani-Sales 1-28, Sa-Chisolm 1-25, Gillcoat 1-25, Matthew Rabino 1-22, Jake Bell 1-20; King Kekaulike, Hunter 2-31, Kaina 1-0.